Two decades ago I had exposed the falsity of Biju Patnaik’s self-projecting claim that he had, in close association with Mahatma Gandhi, given the leadership to India’s freedom movement. On his 20th death anniversary, his son’s government emphatically projected him as a top freedom fighter. High worth advertisements were published in all major dailies, carrying eminent persons’ views on him. To six of eight contemporaries of Biju, he was not a freedom fighter. As BID is a party of no contribution to emergence of India as a sovereign country and Orissa as a State, and there is no reason for the people to stay grateful to this Party, it has been trying to mislead the people with a false propaganda that projects Biju Patnak as a great Freedom fighter. This year on April 17, its department of Information and Public Relations issued full front-page multi-color advertisements to all the dailies of the province, on the occasion of his 20th death anniversary. Why the State exchequer was squandered away in posthumous image-building of a person whom the people had denied mandate when he was alive, is a matter for audit and investigation and a challenge to democratic wisdom of the people. 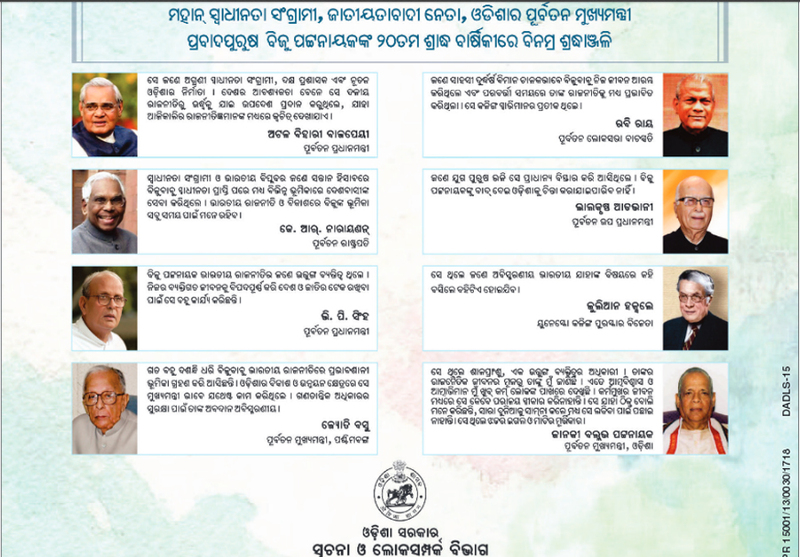 In this costly advertisement, his contemporaries like V.P.Singh, Jyoti Basu, Rabi Ray, L.K.Advani, Julian Huxley and J.B.Patnaik have been quoted. None of them has mentioned him as a freedom fighter. Only two persons namely A.B.Vajpayee and K.R.Narayan have mentioned him as a freedom fighter. But, they had no personal acquaintance with him when the country was fighting for independence. Obviously, therefore, their views were based on hearsay. In 1996 Biju had made his own propaganda as a close associate of Gandhiji in freedom movement. I had exposed his falsehood in my column on 8 February 1996. That article is published in a mega-compilation of my column SINGHABALOKANA (Bharata Bharati, Cuttack, 2010). I deem it proper to reproduce the same here with the intention that, whether or not the propaganda that he was a freedom fighter is false, should be investigated into by an authorized team of scholars. History has the right to be corrected and the people have the right to know what is really correct. The ruling party in Orissa is named after Biju and almost all of the official projects are named after Biju, when Biju’s son is running the government in the name of Biju’s dream. This is creating such confusion in the minds of the gullible voters that despite blatant failure and corruption, the Biju Janata Dal is in power for last 17 years. This is the worst sort of fraud ever played upon the people of our State. Let it be known. Here below is my column wrote in Oriya in the top ranking paper ‘Sambad’ on Feb.8, 1996, as extracted from the book mentioned supra, for the purpose of further research, as Orissa is in deep quagmire due to posthumous political use of Biju Patnaik. Very true sir, They are (Naveen Patnaik and his team)misguiding the people of Orissa everywhere, always, by taking shelter of a foreign language, not lawful, not constitutional, not democratic. The time will come, sir, people will realize the truth and throw them out.